The troop just before heading out. The troop met in the early morning hours of June 10 to head north for summer camp at Camp Daniel Boone. 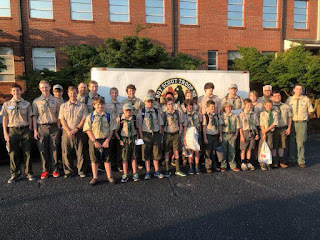 This year's contingent consists of 21 scouts and 5 adults. Nine of the scouts are attending summer camp for the very first time. After everyone got their gear loaded and Mr. Williams led us in a prayer for safe travel and an enjoyable week, we gathered for our traditional photo. Then, we headed out as a convoy to the mountains of North Carolina. We are very grateful for Mr. Chism for pulling our trailer and for AUMC for allowing us to use their buses. After a quick pit stop in Baldwin, GA, we stopped for lunch in Franklin, NC. We opted for the troop tradition of Wendy's, but quickly realized they were not prepared to serve us in a timely fashion. To say they were overwhelmed would be an understatement. 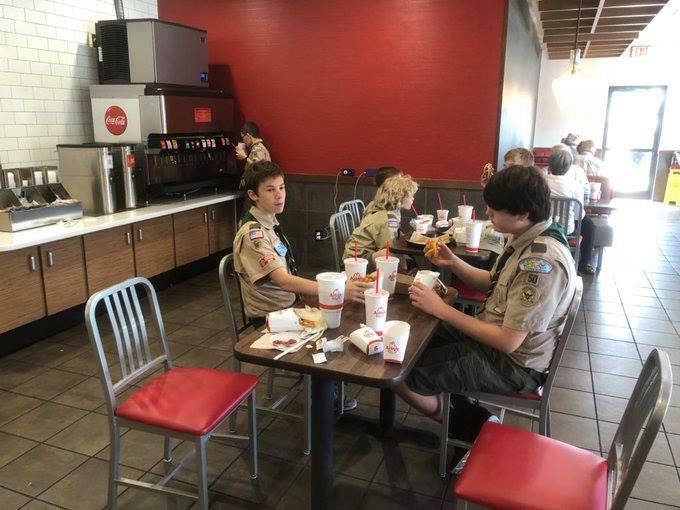 The portion of the the troop that hadn't ordered headed to nearby Arby's and they were much more prepared to meet our lunch needs. We arrived at camp just before 2:15pm, which was pretty much on schedule. We realized upon arrival that there was going to be a heavy dose of "hurry up and wait". The check-in procedure at camp was disappointing and our patience was tested. Efficiency was not a word that would be used to describe any part of this process. There was no time for the swim test since it took so long to do everything else, so only those doing the Zip & Splash Adventure successfully completed the swim test. Others will have that opportunity during their free time if they choose. Hunter, Joe, Nick, and Trey went with Mr. Baird and Mr. Williams to their campsite at the high adventure base (where they will stay for their Zip & Splash adventure). The rest of the troop was able to get settled into their campsite and realized there are cots with no mattresses (not what was promised). However, the campsite is nice with a dining fly (which is not in all campsites) and the tents are all new and larger than what we are accustomed to at summer camp. For dinner we had pot roast, mashed potatoes, green beans, a roll, and chocolate cake for dessert. Milk, water, sweet tea, and bug juice are also available to drink. 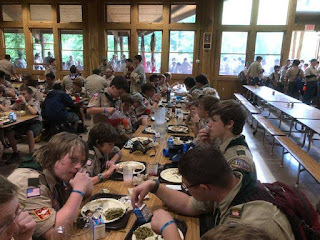 Scouts trying out the dining hall for the first time. We were preparing for the opening campfire and vesper service, but a thunderstorm rolled in and it rained for several hours - cancelling both events. It rained quite a bit for many hours, but everyone made the best of it. The scouts hung out at camp and played a variety of card games, took some showers, and headed to bed. Most everyone had a good night sleep and the sound of the rushing creek near our campsite allowed us to sleep without hearing the snoring from the adult leaders!